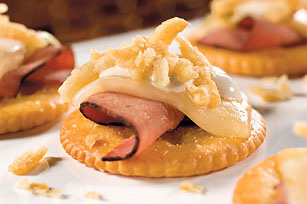 Slow roasted roast beef with melty pepper Jack cheese and cool sour cream sprinkled with French fried onions on buttery crackers? Yes, please! Place crackers in single layer on baking sheet; top with meat and cheese. Bake 4 to 5 min. or until cheese begins to melt. Meanwhile, mix sour cream and steak sauce. Top crackers with sour cream mixture and onions. Serve warm. Substitute leftover cooked steak, cut into 12 bite-size pieces, for the deli roast beef. Prepare using KRAFT Cheddar or Monterey Jack Cheese. This recipe can be easily doubled or tripled to make enough for a party. Just increase the measures of all ingredients proportionately.